A recent breakfast at T-28 Cafe in the Outer Sunset reminded me just how good a cup of hot, strong milk tea tastes on lazy weekend mornings. Although the richness of a well-aged pu-erh or the emerald sweetness of a spring shin-cha give me great pleasure as a tea drinker, neither have a place in my heart like down-home milk tea. 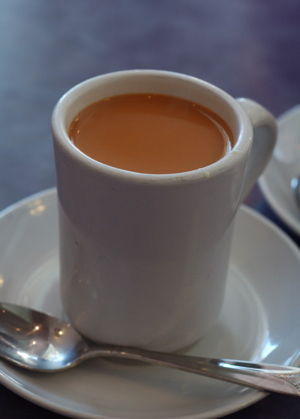 Milk tea is its own religion in Hong Kong, intertwined in the colony’s history and culinary culture. It’s a topic not taken lightly, and I know I enter dangerous territory writing about it as an outsider. I’ve hosted visitors insisted on traveling with their own packets of instant â€œ3-in-1â€ milk tea to ensure that their morning cup wouldn’t be compromised. Although the boba generation may not remember, milk tea helped defined the intersection of east and west. Enjoyed from morning to midnight, it was served on nearly every street corner. Establishments guarded their secret recipes, and even McDonald’s began offering its own version of milk tea. 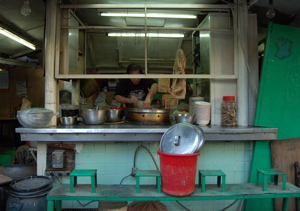 One of the 28 remaining dai pai dong in Hong Kong. Ubiquitous in the 50s and 60s, these street stalls specialized in both hot and cold milk tea as well as fast fare at all times of the day and night. I love those little, built-in, square stools â€“ perfect for hunching over a bowl of noodles. As with any ritual that combines comfort with caffeine, there’s much debate over the specifics, from the type of tea leaves to the brand of milk to the precise mechanics of combining the two. Generally, though, most can agree on some basic tenets for milk tea: a blend of Ceylon and Assam leaves brewed for an extended period, a generous stir of evaporated milk, and a hint of sweetness from a spoonful of condensed milk or sugar. Purists will insist on Black & White brand milk (the one with the cow on the label) and a cloth brewing bag to mimic the fine-textured, oblong filters that lend milk tea its nickname in Cantonese: â€œsilk stocking tea.â€ I’m perfectly okay with English and Irish Breakfast teabags, but even the pragmatist in me admits that milk tea with anything else but evaporated milk falls far from its creator’s intent. The key is brewing the tea over low heat for a very long time. The extra tannin gives enough body and bitterness to balance the milk, so the result is a strong yet silky smooth, creamy, and full-bodied drink that’s as easy to identify by sight as a properly made espresso. In fact, even before the cup arrives, you’ll know: walk into any cafe that makes its own milk tea and you’ll pick up instantly milk tea’s distinctive scent. Marrying into the Wu family means learning new habits. The morning after my wedding, Ba Wu brews a big pot of milk tea for all our guests. Yes, I know, Anglophiles and expats all shudder in horror at the thought of milk tea. But just like a tall glass of Southern sweet tea or a mug of cowboy coffee, the moment you sip one made with integrity and generosity, you’ll understand. For your first cup of milk tea, don’t order from a place that makes it from an instant mix. Instead, look for Hong Kong eateries or bakeries where it appears on a separate drink menu. The popularity of bubble tea means a true milk tea has become extremely difficult to find. Try it at Sweetheart Cafe on Grant, D&A on Broadway, or ABC Bakery on Jackson in SF Chinatown. Slanted Door has an excellent version, lifted out of its Chinese diner ambience but honest, strong and good. My favorite source, T-28 Cafe out on Taraval at 28th Avenue, has an extensive menu that also highlights lemon tea, ginger coke, and other lovely libations. Experiment with various combinations of Ceylon (â€œEnglish Breakfastâ€) and Assam (â€œIrish Breakfastâ€) teas. I personally like the redder, warmer flavors of more Assam leaves, but many prefer the darker, more robust Ceylon. If you use a large mesh ball or one of those muslin tea brewing bags, it’ll be easier to strain loose tea leaves. Of course, teabags sidestep this entirely. 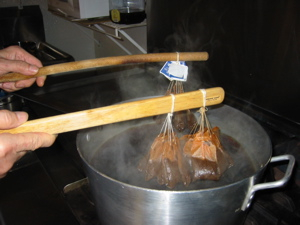 Bring a small pot of water just to the boiling point, but do not let it actually bubble up. Lower the heat to as low as possible. Add three times as many tea bags or twice as much loose tea as you would normally. Cover and leave the tea to brew for at least 10 minutes and up to 30 minutes. Strain out the tea leaves or remove the teabags; for this, it’s okay to squeeze teabags to get the extra boost. Stir in evaporated milk until the tea is the color of caramel, then bring the tea back to very hot serving temperature. Divide the tea among several cups and invite your guests to stir in a spoonful of sweetened condensed milk or sugar.